A hearty hailstorm can lead to many damaged cars in often a relatively small area. This means that great demand for hail damage specialists arises in that specific area. Bringing these people together quickly is almost impossible, but Hail Team Holland can make it work! Hail Team Holland, a collaboration of dozens of professionals in beating out dents without spraying technique. One contact point, one name. We are there for you! 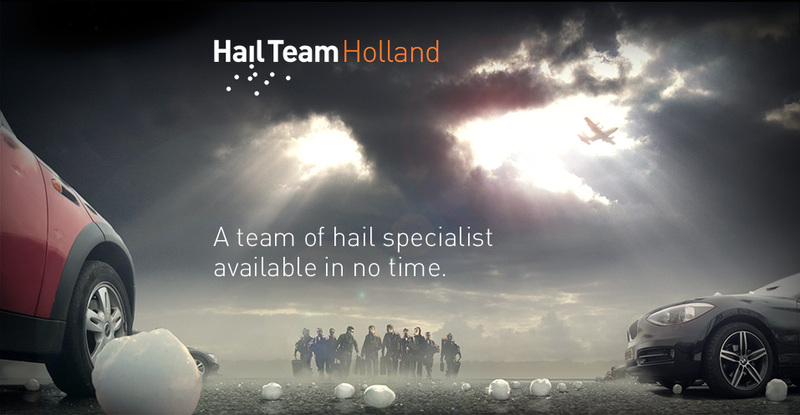 You can now contact Hail Team Holland and we will coordinate the rest and arrange professional people to get to work in order to repair the damage as soon as possible. For more information or to make a reference to hail damage calamities, you can call Hail Team Holland or you can send us an email. All communication runs via one contact point that manages the coordination of all technical and administrative procedures. By bringing together specialist in this manner, having them do what they are good at and completely coordinating all accompanying procedures for them and for you, we can start up with resolute determination and flexibility to face hail damage calamities here and abroad. In a very short period of time, we are capable of repairing vast amounts of vehicles, where it is needed most. Hail Team Holland is a large group of professionals that can be employed, nationally as well as internationally, to repair calamities regarding hail damage to private cars, commercial cars, in short everything that comprises beating out dents without spraying. Our professionals work in close collaboration with the umbrella organisation, but are all self-employed. This entails that we have only selected proper professionals and compounded a group disposing of great talent and years of experience. A group of people that can rely on each other and that appeals to high continuation and availability through the collaboration structure.